Isn’t it ironic that elk and other animals move “down” to the lowest valley they can find, while we try to climb “up” to the highest places for adventures - skiing or climbing a variety of thrilling mountains. Winter Retreat is a compilation of some of the best visual scenes and experiences Mark and his family have encountered when going on a needed vacation to the Mountains. 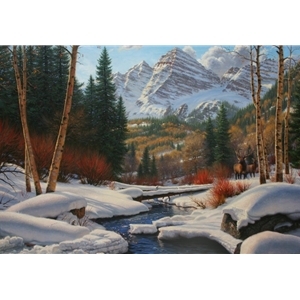 The Maroon Bells mountain range near Aspen, the sparkling blue waters of Crystal Creek, and the deep snow that would wear you and me out in just minutes are the everyday surroundings for these critters that live in our Winter Retreat.